"Pennsylvania German" redirects here. For the language, see Pennsylvania German language. The Pennsylvania Dutch (Pennsilfaanisch-Deitsche), also referred to as the Pennsylvania Germans, are a cultural group formed by early German-speaking immigrants to Pennsylvania and their descendants. The word "Dutch" does not refer to the Dutch people or Dutch language, but to the German settlers, known as Deutsch (in standard German) and Deitsch (in the principal dialect they spoke, Palatine German). Most emigrated, in the 17th and 18th centuries, to the Americas from within the Holy Roman Empire, which included areas that were later to become Germany and Switzerland. Over time, the various dialects spoken by these immigrants fused into a unique dialect of German known as Pennsylvania German or Pennsylvania "Dutch". The Pennsylvania Dutch maintained numerous religious affiliations, with the greatest number being Lutheran or German Reformed, but also with many Anabaptists, including Mennonites, Amish, and Brethren. The Anabaptist religions promoted a simple lifestyle, and their adherents were known as Plain people or Plain Dutch. This was in contrast to the Fancy Dutch, who tended to assimilate more easily into the American mainstream. Other religions were also represented by the late 1700s, in smaller numbers. listen (help·info); usually called Pennsylvania Dutch) is a variety of West Central German spoken by the Amish, Old Order Mennonites, and other descendants of German immigrants in the United States and Canada, closely related to the Palatine dialects. During the Middle Ages the word "Dutch" in English referred to West Germanic speakers of continental Europe in general. From c. 1600 onward it was mainly restricted to the inhabitants of the Low Countries. After the Second World War, use of Pennsylvania German virtually died out in favor of English, except among the more insular and tradition-bound Anabaptists, such as the Old Order Amish and Old Order Mennonites. 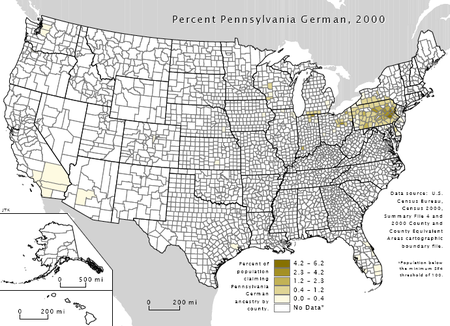 A number of German cultural practices continue to this day, and German Americans remain the largest ancestry group claimed in Pennsylvania by people in the census. The Pennsylvania Dutch live primarily in Southeastern and in Pennsylvania Dutch Country, a large area that includes South Central Pennsylvania, in the area stretching in an arc from Bethlehem and Allentown through Reading, Lebanon, and Lancaster to York and Chambersburg. Some Pennsylvania Dutch live in the historically Pennsylvania Dutch-speaking areas of Maryland, North Carolina, and Virginia. Many Pennsylvania Dutch were descendants of refugees who had left religious persecution in the Palatinate of the German Rhine. For example, some Amish and Mennonites came to the Palatinate and surrounding areas from the German-speaking part of Switzerland, where, as Anabaptists, they were persecuted, and so their stay in the Palatinate was of limited duration. Most of the Pennsylvania Dutch have roots going much further back in the Palatinate. During the War of the Grand Alliance (1689–97), French troops pillaged the Palatinate, forcing many Germans to flee. The War of the Palatinate (as it was called in Germany), also called the War of the League of Augsburg, began in 1688 as Louis XIV laid claim to the Electorate of the Palatinate. French forces devastated all major cities of the region, including Cologne. By 1697 the war came to a close with the Treaty of Ryswick, now Rijswijk in the Netherlands, and the Palatinate remained free of French control. However, by 1702, the War of the Spanish Succession began, lasting until 1713. French expansionism forced many Palatines to flee as refugees. The devastation of the Thirty Years' War (1618-1648) and the wars between the German principalities and France caused some of the immigration of Germans to America from the Rhine area. Members of this group founded the borough of Germantown, in northwest Philadelphia County, Pennsylvania, in 1683. They settled on land sold to them by William Penn. Germantown included not only Mennonites but also Quakers. This group of Mennonites was organized by Francis Daniel Pastorius, an agent for a land purchasing company based in Frankfurt am Main. None of the Frankfurt Company ever came to Pennsylvania except Pastorius himself, but 13 Krefeld German (Dutch-speaking) Mennonite families arrived on October 6, 1683, in Philadelphia. They were joined by eight more Dutch-speaking families from Hamburg-Altona in 1700 and five German-speaking families from the Palatinate in 1707. In 1723, some 33 Palatine families, dissatisfied under Governor Hunter's rule, migrated from Schoharie, New York, along the Susquehanna River to Tulpehocken, Berks County, Pennsylvania, where other Palatines had settled. They became farmers and used intensive German farming techniques that proved highly productive. Pictures from Old-Germantown. Shown here is the first log cabin of Pastorius about 1683, Pastorius' later house about 1715, print shop and house of Saurs about 1735, and the market square about 1820. The Pennsylvania Dutch composed nearly half of the population of Pennsylvania and, except for the nonviolent Anabaptists, generally supported the Patriot cause in the American Revolution. Henry Miller, an immigrant from Germany of Swiss ancestry, published an early German translation of the Declaration of Independence (1776) in his newspaper Philadelphische Staatsbote. Miller often wrote about Swiss history and myth, such as the William Tell legend, to provide a context for patriot support in the conflict with Britain. Frederick Muhlenberg (1750–1801), a Lutheran pastor, became a major patriot and politician, rising to be elected as Speaker of the U.S. House of Representatives. An early group, mainly from the Roxborough-Germantown area of Pennsylvania, emigrated to then colonial Nova Scotia in 1766 and founded the Township of Monckton, site of present day Moncton, New Brunswick. The extensive Steeves clan descends from this group. After the American Revolution, John Graves Simcoe, Lieutenant Governor of Upper Canada, invited Americans, including Mennonites and German Baptist Brethren, to settle in British North American territory and offered tracts of land to immigrant groups. This resulted in communities of Pennsylvania Dutch speakers' emigrating to Canada, many to the area called the German Company Tract, a subset of land within the Haldimand Tract, in the Township of Waterloo, which later became Waterloo County, Ontario. Some still live in the area around Markham, Ontario  and particularly in the northern areas of the current Waterloo Region. Some members of the two communities formed the Markham-Waterloo Mennonite Conference. Today, the Pennsylvania Dutch language is mostly spoken by Old Order Mennonites. From 1800 to the 1830s, some Pennsylvania Dutch Mennonites in Upstate New York and Pennsylvania moved north to Canada, primarily to the area that would become Cambridge, Ontario, Kitchener, Ontario/Waterloo, Ontario and St. Jacobs, Ontario/Elmira, Ontario/Listowel, Ontario in Waterloo County, Ontario. Settlement started in 1800 by Joseph Schoerg and Samuel Betzner, Jr. (brothers-in-law), Mennonites, from Franklin County, Pennsylvania. Other settlers followed mostly from Pennsylvania typically by Conestoga wagons. Many of the pioneers arriving from Pennsylvania after November 1803 bought land in a 60,000 acre section established by a group of Mennonites from Lancaster County Pennsylvania, called the German Company Lands. Many of the Mennonite Germans from Pennsylvania arrived in Waterloo County in Conestoga wagons. Fewer of the Pennsylvania Dutch settled in what would later become the Greater Toronto Area in areas that would later be the towns of Altona, Ontario, Pickering, Ontario and especially Markham Village, Ontario and Stouffville, Ontario. Peter Reesor and brother-in-law Abraham Stouffer were higher profile settlers in Markham and Stouffville. William Berczy, a German entrepreneur and artist, had settled in upstate New York and in May 1794, he was able to obtain 64,000 acres in Markham Township, near the current city of Toronto, Ontario. Berczy arrived with approximately 190 German families from Pennsylvania and settled here. Others later moved to other locations in the general area, including a hamlet they founded, German Mills, Ontario, named for its grist mill; that community is now called Thornhill, Ontario), in the township that is now part of York Region. The immigrants of the 1600s and 1700s who were known as the Pennsylvania Dutch included Mennonites, Swiss Brethren (also called Mennonites by the locals) and Amish but also Anabaptist-Pietists such as German Baptist Brethren and those who belonged to German Lutheran or German Reformed Church congregations. Other settlers of that era were of the Moravian Church while a few were Seventh Day Baptists. Calvinist Palatines and several other religions to a lesser extent were also represented. Over 60% of the immigrants who arrived in Pennsylvania from Germany or Switzerland in the 1700s and 1800s were Lutherans and they maintained good relations with those of the German Reformed Church. The two groups founded Franklin College (now Franklin & Marshall College) in 1787. Henry Muhlenberg (1711–1787) founded the Lutheran Church in America. He organized the Ministerium of Pennsylvania in 1748, set out the standard organizational format for new churches and helped shape Lutheran liturgy. Muhlenberg was sent by the Lutheran bishops in Germany, and he always insisted on strict conformity to Lutheran dogma. Muhlenberg's view of church unity was in direct opposition to Nicolaus Ludwig Zinzendorf's Moravian approach, with its goal of uniting various Pennsylvania German religious groups under a less rigid "Congregation of God in the Spirit." The differences between the two approaches led to permanent impasse between Lutherans and Moravians, especially after a December 1742 meeting in Philadelphia. The Moravians settled Bethlehem and nearby areas and established schools for Native Americans. ^ Donald F. Durnbaugh. "Pennsylvania's Crazy Quilt of German Religious Groups". Journals.psu.edu. Retrieved 2017-08-28. ^ "Online Etymology Dictionary". Etymonline.com. Retrieved 2017-08-28. ^ Fogleman, Aaron Spencer (1996). Hopeful Journeys: German Immigration, Settlement, and Political Culture in Colonial America, 1717-1775. Philadelphia, PA: University of Pennsylvania Press. p. 197. ISBN 978-0812215489. ^ American FactFinder, United States Census Bureau. "American Community Survey 3-Year Estimates". Factfinder.census.gov. Retrieved 2010-07-31. ^ Lancaster, Discover. "PA Amish Lifestyle - How the community of Amish in PA live today". Discover Lancaster. ^ Steven M. Nolt. Foreigners in their own land: Pennsylvania Germans in the early republic. Books.google.com. p. 13. Retrieved 2017-08-28. ^ "Chapter Two - The History Of The German Immigration To America - The Brobst Chronicles". Homepages.rootsweb.ancestry.com. Retrieved 2017-08-28. 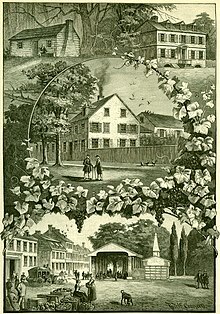 ^ "Historic Germantown - Encyclopedia of Greater Philadelphia". Philadelphiaencyclopedia.org. Retrieved 2017-08-28. ^ "Germantown Mennonite Settlement (Pennsylvania, USA) - GAMEO". gameo.org. Retrieved 28 August 2017. ^ a b "German Settlement in Pennsylvania : An Overview" (PDF). Hsp.org. Retrieved 2017-08-28. ^ "The Palatinate". Swissmennonite.org. Archived from the original on 2017-08-29. Retrieved 2017-08-28. ^ Pennsylvania Dutch Cooking: Traditional Dutch Dishes. Gettysburg, PA: Dutchcraft Company. ^ Bowser, Les (2016). The Settlers of Monckton Township, Omemee ON: 250th Publications. ^ "Biography – SIMCOE, JOHN GRAVES – Volume V (1801-1820) – Dictionary of Canadian Biography". Biographi.ca. Retrieved 2017-08-28. ^ "Ontario's Mennonite Heritage". Wampumkeeper.com. Retrieved 2013-05-10. ^ a b c "Kitchener-Waterloo Ontario History - To Confederation". Kitchener.foundlocally.com. Retrieved 2017-08-28. ^ "The Walter Bean Grand River Trail - Waterloo County: The Beginning". www.walterbeantrail.ca. Retrieved 30 September 2018. ^ a b "History of Markham, Ontario, Canada". Guidingstar.ca. Retrieved 2017-08-28. ^ a b Ruprecht, Tony (14 December 2010). "Toronto's Many Faces". Dundurn. Retrieved 28 August 2017 – via Google Books. ^ a b "History" (PDF). Waterloo Historical Society 1930 Annual Meeting. Waterloo Historical Society. 1930. Retrieved 13 March 2017. ^ Elizabeth Bloomfield. "BUILDING COMMUNITY ON THE FRONTIER : the Mennonite contribution to shaping the Waterloo settlement to 1861" (PDF). Mhso.org. Retrieved 2017-08-28. ^ "York County (Ontario, Canada)". Gameo.org. Retrieved 2017-08-28. ^ "What is Pennsylvania Dutch?". Padutch.net. 24 May 2014. Retrieved 2017-08-28. ^ "The Germans Come to North America". Anabaptists.org. Retrieved 2017-08-28. ^ a b Shea, John G. (27 December 2012). "Making Authentic Pennsylvania Dutch Furniture: With Measured Drawings". Courier Corporation – via Google Books. ^ Gibbons, Phebe Earle (28 August 1882). ""Pennsylvania Dutch. ": And Other Essays". J.B. Lippincott & Company. Retrieved 28 August 2017 – via Google Books. ^ a b Murtagh, William J. (28 August 1967). "Moravian Architecture and Town Planning: Bethlehem, Pennsylvania, and Other Eighteenth-Century American Settlements". University of Pennsylvania Press. Retrieved 28 August 2017 – via Google Books. ^ Donald F. Durnbaugh. "Pennsylvania's Crazy Quilt of German Religious Groups" (PDF). Journals.psu.edu. Retrieved 2017-08-28. ^ Murtagh, William J. (28 August 1967). "Moravian Architecture and Town Planning: Bethlehem, Pennsylvania, and Other Eighteenth-Century American Settlements". University of Pennsylvania Press. Retrieved 28 August 2017 – via Google Books. Bronner, Simon J. and Joshua R. Brown, eds. Pennsylvania Germans: An Interpretive Encyclopedia (: Johns Hopkins UP, 2017), xviii, 554 pp. Louden, Mark L. Pennsylvania Dutch: The Story of an American Language. Baltimore, MD: Johns Hopkins University Press, 2016. Wikisource has the text of the 1905 New International Encyclopedia article Pennsylvania Dutch.